About | Learn the skills of exceptional parenting! Welcome to my parenting tips blog! My name is James Espy. I am the founder and head instructor of Traditional Martial Arts Academy. I began teaching in 1996 at the University of Texas at Austin. In 2004, I began researching child development and developing programs for kids. Martial arts has a reputation for helping children with achievement, focus, self-discipline and improved behavior. 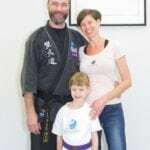 Having worked with thousands of kids over the years, I saw the impact that my programs were having on kids and decided to drill down into why martial arts was such a positive influence. For years, I have explored the latest research and ideas on developmental psychology and educational theory to better understand how children develop into happy, healthy adults. The results of my efforts have shaped the programs my school offers families, but have also informed my understanding of children needs in general and, by extension, how parents can be more effective in their roles in their children’s lives. In working with families over the years, and experimenting with my wife Julie in how we parent our own child, I have uncovered principals of parenting that I share in this blog. I hope that you find the information in these articles helpful in your efforts to be a more skillful and effective parent!